Mounts to most Allis Chalmers Tractors. 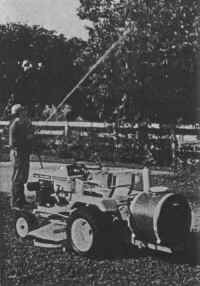 Ideal for spraying fruit and shade trees, shrubbery, gardens, lawns. Spray bar attachment available to cover 80" wide path for liquid fertilizer treatment of gardens. Piston pump with cast iron body and stainless steel inserts develops high pressure as necessary. Polyethylene tank will never corrode or rust out. 22 gallon polyethylene tank, large fill hole. Line return from control valve enters tank and provides constant agitation of spray liquid or wettable powders. Line strainer aids in preventing spray nozzles from clogging. 3 gallons per minute at 300 psi provides penetrating spray into heavy green growth, trees or shrubbery alike. Handles all common insecticides, fungicides, weed killers even whitewash. Complete with relief valve, hand spray gun, 25 feet of pressure hose as standard. Quickly mounts to your tractor, all mounting brackets included. Pressure gauge and pulsation dampener -- optional. 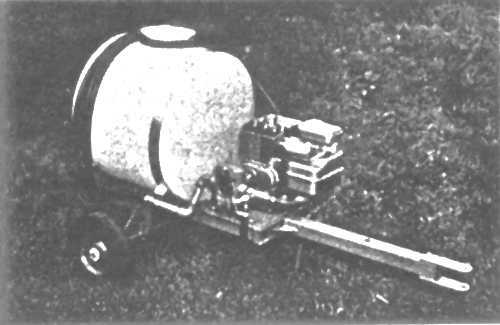 Four nozzle spray boom for weed control (optional). AC-TS shown mounted on a B-110 garden tractor will spray to 30 ft. height. Model P.S. 300T self powered sprayer shown below. Tow behind your tractor. 3 hp engine provides power.